Ari and I presented at our first bridal expo last month, The Wedding Fair put on by the Twin Cities Bridal Association! A lot of thought and effort went into all of the elements in our booth. We wanted to try to appeal to the creative, offbeat, DIY bride, so we knew that anything we did would have to be handmade. We started with a feature wall; the wall is made of wood salvaged from pallets that we found by dumpsters outside of various warehouses, waiting to be hauled away to the land fill (we asked before taking of course). Ari was the mastermind behind keeping the 200 pound thing from falling over, What would I do with out him? I also teamed up with my dad to build two console tables for the booth. In case you're interested in building your own, we followed this plan by Ana White. It was a great project for a beginner like me, although I still needed lots of advice from my Dad to get it right. It was so much fun to meet such a variety of brides and grooms; from the classic church wedding, to the rustic barn ceremony, to the off beat bowling alley venue, we heard it all! We are so excited to talk more with everyone that we met and shoot some of their amazing wedding days! In case you missed it, here are a few shots of our booth! 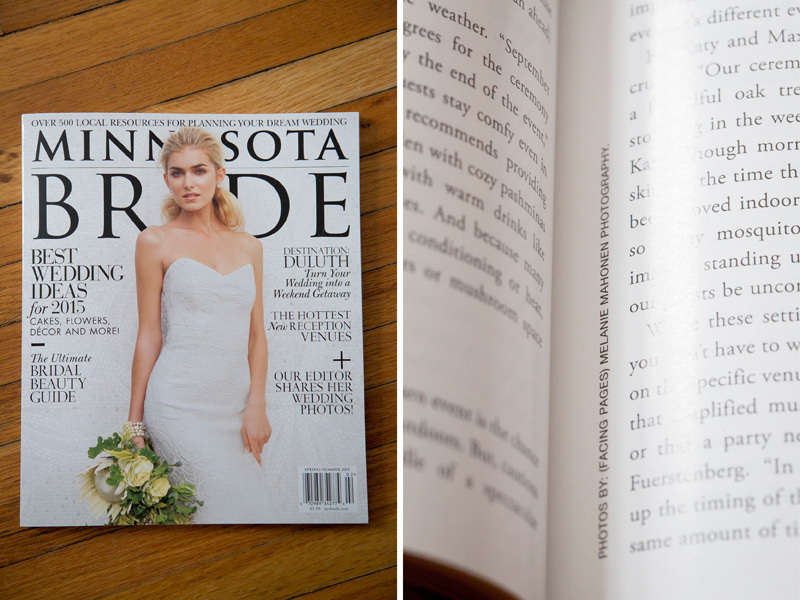 A few of our images from Al and Meredith's July 4th wedding day will be appearing in the 2015 summer issue of Minnesota Bride Magazine! The issue just hit the stands, so run out and grab your copy! Here's a link to the full story. Here it is folks! My photo on display at the Minnesota State Fair! Go check it out, it's in the Eco Experience Building in the Minnesota Climate Change display!